Despite temporary slowdowns, the demand for transport of both passengers and goods has been growing steadily and is projected to continue. As such, more and more cars are sold in Europe, the majority of which are diesel powered. And while engines are becoming more efficient, this growth means GHG emissions are a major concern. Europe is connected through a network of roads, railway lines, inland waterways, inland and maritime ports, airports and rail-road terminals. Not counting secondary roads and railway lines, the trans-European transport network (TEN-T) alone consists of more than 138 000 km of railway lines, 136 700 km of roads and 23 506 km of inland waterways. Around 879 million passengers travelled by air in the European Union in 2014, of whom 73 million used London’s Heathrow Airport alone. Finally, close to 3.8 billion tonnes of goods were handled in EU ports, 10 % of which was handled by Rotterdam. The volume of freight has increased considerably since the 1990s, despite a relative decrease following the economic recession in 2008. This increase has been largely accommodated by road transport, which accounted for 49 % of EU freight transported in 2013, and to a lesser extent, sea and rail transport. However, road transport emits considerably more carbon dioxide (CO2) per kilometre than other modes, such as rail and inland waterways. Similarly, the demand for passenger transport (measured in passenger kilometres) also grew by more than 8 % between 2000 and 2013 in the EU, with flying experiencing the most rapid growth. Finally, EU citizens travelled approximately 12 850 km per person in 2013 — more than 70 % by car — representing a 5 % increase from 2000. This growth means that road transport now accounts for almost three quarters of the energy used in transport in the EU. Sales of new passenger cars in the EU increased by 9 % in 2015 compared to the previous year, with a total of 13.7 million new cars registered. Recent data point to a growth in diesel consumption in road transport, up from 52 % of total road fuel consumption in 2000 to 70 % in 2014. Similarly, just over half of the vehicles sold in Europe are diesel, corresponding to 52 % of sales in 2015. The share of diesel vehicle sales varies from country to country, ranging from 71 % in Ireland and Luxembourg to 29 % in the Netherlands and 28 % in Denmark. Larger vehicles are more likely to use diesel, and over last four decades, the average mass of passenger cars has increased mainly due to consumer preferences and improved safety standards. Heavier cars tend to use more fuel and emit more greenhouse gases and pollutants. Different types of electric vehicles are now available on the European market. Some rely entirely on an electric battery to power the vehicle, while others use a combination of electricity and petrol/diesel-hybrids. More and more hybrid and battery-electric vehicles are being sold in the EU. Although they still represent just 1.3 % of all new cars sold, in some countries, electric cars are becoming a more common sight. According to provisional data, in the Netherlands 12 % and in Denmark 8 % of the new cars sold in 2015 were electric or plug-in hybrid. In terms of purely electric cars, the largest number of registrations was recorded in France (more than 17 650 vehicles), Germany (more than 12 350 vehicles) and the UK (more than 9 900 vehicles). Electric two wheelers have also become more common, especially for journeys within urban areas. Financial incentives, such as subsidies or preferential tax treatments (e.g. free parking in city centre, possibility to drive on bus lanes, free tolls, lower fuel or registration taxes), play a major role in the consumer’s choice of the type of car purchased. Motorised vehicles need the energy generated from fuel (e.g. petrol, diesel, electricity, natural gas, biofuels) to move. But the high temperature combustion of fossil fuels in engines releases air pollutants and CO2 into the atmosphere. Transport demand is closely linked to economic activity: in periods of growth, economic output goes up, more goods are transported and more people travel. The economic recession of 2008 resulted in lower transport demand and, consequently, in reduced greenhouse gas emissions (GHG) from the sector in the following years following. Despite this slow down period, the EU’s overall transport emissions in 2014 were 20 % higher than their 1990 levels. 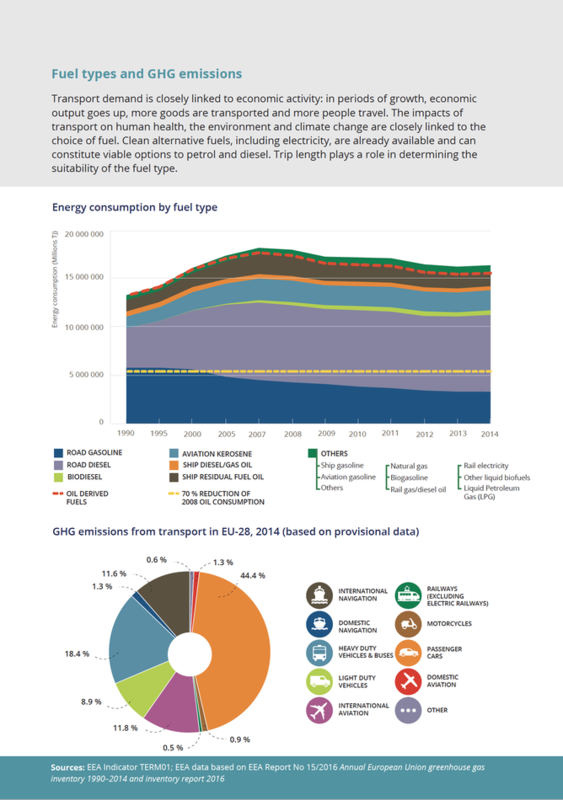 In 2014, about a quarter of the EU’s total GHG emissions came from transport. According to preliminary data, passenger cars contributed to 44 % of transport sector emissions, and heavy-duty vehicles and buses a further 18 %. Emissions from different transport modes varied substantially over time. International aviation emissions almost doubled and road transport increased by 17 % in this period, whereas emissions from rail transport and inland navigation declined by more than 50 % and almost 37 % respectively. The EU has set itself several targets to reduce GHG emissions from transport. In its White Paper published in 2011, the European Commission set a target of a 60 % reduction from 1990 levels by 2050. This means that current levels need to be reduced by two thirds. Transport also needs to contribute to the EU’s overall targets for GHG emissions reductions by 2020 and 2030. Part of the 2030 target will be achieved through the EU Emissions Trading Scheme (EU ETS). Although it includes emissions from aviation, other transport emissions are excluded. This means that with the exception of intra-EU aviation, the remaining transport modes will need to contribute to the 30 % reduction effort for the sectors excluded from the EU ETS. To achieve GHG emissions reductions in these non-ETS sectors, the overall EU effort is shared among Member States. Each country then decides how to achieve its national target. This is known as the Effort Sharing Decision and it will contribute to a ‘30% reduction by 2030’. Currently, around one third of the GHG emissions from non-ETS sectors come from the transport sector. The EU’s transport sector depends on oil for 94 % of its fuel, 90 % of which is imported. This makes it particularly vulnerable to instability and changes in the global energy market. A disruption in the energy supply could severely undermine the economy and hamper the quality of life in the EU. To this end, the EU aims to reduce its oil consumption in transport (including maritime bunkers) by 70 % by 2050 compared to 2008 levels. All these targets require reliable and effective monitoring and measuring systems to measure progress. The European Environment Agency helps evaluate progress through datasets, indicators and reports, including the annual transport and environment report TERM. To help reduce the EU’s overall GHG emissions, the EU has put in place increasingly stringent mandatory targets for average CO2 emissions for new passenger cars and vans. By 2015, new cars registered in the EU had to achieve the average emissions target of 130 grams of CO2 per kilometre (g CO2/km). This target was achieved two years ahead of the deadline. According to the latest EEA data, new cars registered in 2015 emitted on average 119.6 g CO2/km. The next target is set at 95 g CO2/km by 2021. Similar targets are set for light commercial vehicles (vans). New vans registered in the EU must meet the average emissions targets of 175 g CO2/km by 2017, and 147 g CO2/km by 2020. The 2017 target was achieved four years ahead of schedule. In 2015, average emissions for new vans amounted to 168.2 g CO2/km. Official test results show that vehicles are becoming more energy-efficient and are polluting less. However, there are concerns regarding the way emissions are measured. The targets set in EU legislation are based on a standardised procedure, which is necessary to compare between different models over time. The testing procedure currently used in the EU — the New European Driving Cycle — was introduced in 1970 and last updated in 1997. It no longer reflects real-world driving conditions in Europe. European traffic has changed considerably since then. Cars have become heavier and faster; roads more congested. The current procedure also allows manufacturers many flexibilities in testing parameters, such as vehicle mass, tyre pressure and adjustments to brakes. As a result of all these factors combined, cars and vans tend to emit significantly higher amounts of carbon dioxide on the road than in a laboratory under the current testing procedure. According to research by the International Council on Clean Transportation (ICCT), real-world emissions of CO2 are up to 40 % higher than emissions measured in the testing laboratory. Recognising such shortcomings, in January 2016, the European Commission proposed a number of changes to the current vehicle type-approval framework. These are designed to strengthen the independence of vehicle testing, and improve the enforcement and market surveillance regimes. A new emissions testing procedure known as the ‘Worldwide harmonized Light vehicles Test Procedure’ (WLTP) will also be introduced in the future so that laboratory results can better represent actual vehicle performance on the road. However, the date of its introduction remains to be decided. This should help ensure more accurate reporting of emissions and fuel data, which will also provide better guidance to consumers and help them make informed decisions. In 2013, the EU transport sector contributed 13 % and 15 % of the total PM10 and PM2.5 primary emissions, respectively. While exhaust emissions from vehicles have fallen since 1990, reflecting advances in vehicle technologies such as particulate filters, in contrast, non-exhaust emissions of particulate matter from brake and tyre wear have increased. Today, these non-exhaust sources make up a large fraction of total vehicle particulate matter emissions — around half of PM10 and a third of PM2.5 emissions. In addition, emissions from international shipping within European seas contribute an additional 15 % of the total PM2.5 emissions in the EU. This is notably a problem in major port cities. Nitrogen dioxide (NO2) and fine particulate matter (PM2.5) are the two main air pollutants from road transport. To limit exhaust emissions from passenger vehicles, the EU has introduced ‘Euro standards’ for various air pollutants, including NOx and PM. Euro standards set different limits for petrol and diesel vehicles per pollutant and have become increasingly stringent over time. For example, a diesel car tested according to the latest ‘Euro 6’ technology is allowed to emit just 3 % of the particulate matter that a diesel car tested under the Euro 1 technology could emit 20 years earlier. Such standards have been instrumental in reducing air pollution from transport. Emissions of nitrogen oxides (NOx) from petrol cars have decreased significantly since 2000, although those from diesel cars have not decreased to the same extent. Without effective after-treatment, diesel engines, in particular, are high emitters of nitrogen dioxide (NO2). NO2 is a significant problem at ground level in urban areas, with the transport sector the largest contributor to emissions, accounting for 46 % of total NOx emissions in the European Union in 2013. The number of diesel vehicles on the road has been increasing in recent years, impacting air quality. Without this ‘dieselisation’, air quality in Europe would have improved further. Discrepancies exist between real-world and test measurements of NOx. ICCT studies estimated that real-world NOx emissions from diesel vehicles were on average seven times higher than the limits set by the Euro 6 standard. To help reduce this gap, the EU has recently agreed on a ‘Real Driving Emissions’ test procedure for NOx emissions from new cars starting in 2017. Public awareness of the high on-road emissions of NOx emissions has also greatly increased following the September 2015 revelations that Volkswagen used a so-called ‘defeat device’ in diesel cars to lower emissions during vehicle testing in the USA. The European Union and national authorities are currently carrying out investigations on the issue of vehicle emissions including the potential use of such cheat devices in Europe. Transport continues to rely heavily on fossil fuels, especially petrol and diesel. The impacts of transport on human health, the environment and climate change are closely linked to the choice of fuel. Clean alternative fuels, including electricity, are already available and can constitute viable options to petrol and diesel. Trip length plays a role in determining the suitability of the fuel type. For example, electricity might be more suited to passenger cars in urban settings or those travelling shorter-distances. The uptake of cleaner fuels also depends on the extent of the infrastructure and incentives offered to prospective owners (lower taxation, free tolls, etc.). EU legislation requires that each EU Member State meets 10 % of its transport energy consumption from renewable energy sources by 2020. The legislation identifies certain sustainability criteria and only those biofuels that comply with these criteria are considered ‘sustainable’ according to this legislation. Moreover, the end product (electricity, biofuels, etc.) is not the only factor determining how environmentally sustainable a fuel is. The way the actual fuel is produced should also be taken into account. For example, electricity generated by wind power is certainly cleaner than electricity produced by coal. Transport’s demand for energy can be best addressed through a comprehensive analysis and vision for the entire energy system, taking into account the demand from all economic sectors and the supply potential from a mix of energy sources. Preliminary data for 2014, including international aviation and excluding international maritime GHG emissions. One-fifth excluding international aviation and shipping. Nitrogen oxides (NOx) is a generic term, referring to nitric oxide (NO) and nitrogen dioxides (NO2). NOx gases are formed whenever combustion occurs in the presence of nitrogen (in air and/or in the fuel), e.g. in an air-breathing engine. NOx can also be formed naturally, e.g. by lightning. Indicative target stipulated in the Renewable Energy Directive. Vehicle emissions and efficiency Fossil fuel powered road transport represents the most significant source of transport related air pollution. Each vehicle releases pollutants from a number of sources. For references, please go to https://www.eea.europa.eu/signals/signals-2016/articles/transport-in-europe-key-facts-trends or scan the QR code.